"I think that given the graphic nature of these photos, it would create some national security risk. It is important for us to make sure that very graphic photos of somebody who was shot in the head are not floating around as an incitement to additional violence. As a propaganda tool. 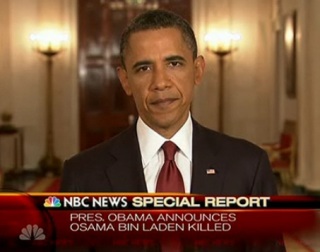 There's no doubt that Bin Laden is dead. And so we don't think that a photograph in and of itself is going to make any difference. There are going be some folks who deny it. The fact of the matter is, you will not see bin Laden walking on this earth again." and make life harder for the troops. more conclusively than a photograph. than a need for closure. was to confirm bin Laden's death. We are desensitized to gory images. The photos will be too gory. to show that proper burial rights were given. Should the White House release the photos of Osama bin Laden's dead body?